Je viens de Paris. - J'en viens aussi ! I come from Paris. - I come from there too! Que penses-tu de cette exposition ? - J'en pense le plus grand bien ! What do you think of this exhibition? - I think very highly of it. Je m'occupe de mes problèmes. Je m'en occupe. I'm dealing with my problems. I'm dealing with them. -> Note that en can replace plural things too. Elle a besoin de vacances. Elle en a besoin. She needs holidays. She needs them. 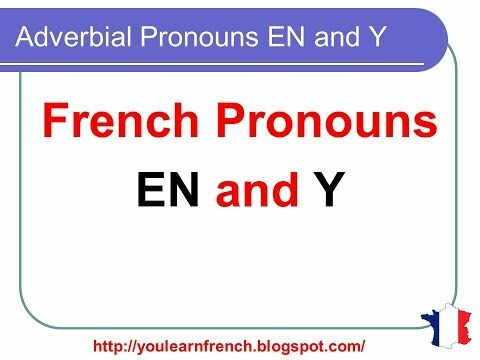 Notice that en as a pronoun can replace phrases introduced by the preposition de + [thing]/[object]/[location] (but not people), particularly with verbs that require de. In such cases, you cannot replace the noun alone with a pronoun, you must replace the whole de + [noun] group with en. Tu te moques de Paul et Daniel. - Non, je ne me moque pas d'eux ! You're mocking Paul and Daniel. - No, I'm not mocking them! J'ai besoin de ma mère tous les jours. - J'ai besoin d'elle aussi. I need my mother every day. - I need her too. J'ai des chocolats. - J'en ai. I've got chocolates. - I've got some. Il se sert de ses outils. - Je m'en sers aussi. He's using his tools. - I'm using them too. Tu joues de la trompette. - Tu en joues. Je mange de la purée. - J'en mange. I'm eating mash. - I'm eating some. Dans ce cas ci-dessous, l'emploi de « en » ( Il n'en faut ) est-il correct ? Je cherche une guitare usagée. Il n'en faut pas être de haute qualité, mais qu'il soit en bon état. C'est pour apprendre à jouer. Dans la dernière phrase « C'est pour apprendre à jouer. » est-il possible d'utiliser « en » « Y » ou « la / l' » pour faire mention à la guitare ? Si oui, est-il mieux de l'ajouter selon l'usage normal ? "En" in this context can be thought of to stand for "of that", even though it doesn't translate very well like this. It’s the linguistic underpinning I’m after... not the “translation”. “Je voulais en savoir plus.”. is the meaning. I’d like to know why and when a native speaker would add “de...” after “en” has already been used in same sentence. I'm afraid you're looking for an explanation where there is none. "Je voulais en savoir plus" is like an idiomatic expression. And French is a highly idiomatic language where rules seem to be there to only to justify the exceptions. what is the difference between ”take care of him” vs “take care of them”. one is right, one is wrong but they both relate to ‘a person/people’ not things. he takes care of him right away. In the last sentence, en replaces des fleurs and "them" refers to an object, not a person. If you were taking of persons, you would need a different construction. Luc s'occupe de mes parents. -- Luc s'occupe d'eux. but in this quizz, the 2 correct answers were “he takes care of it” AND “he takes care of THEM”. Given your reasoning “he takes care of THEM” is also incorrect yetbit was added to the correct answer and my “he takes care of him” was marked wrong. Isn’t “He Takes care of THEM” just as wrong as “he takes care of HIM”? If you read my previous post again, I did include an example using "them" referring to flowers. Since flowers aren't people, the use of "en" is OK.
Il s'occupe des fleurs. Il s'en occupe. -- He takes care of them (the flowers). i did read your previous post. your example does not have any relevance to the example in the quizz which didnt specify whether or not ‘en’ was supposed to rever to inanimate objects or humans. It’s the specific quizz question that i am querying. Well "en" cannot refer to persons, therefore there's no need to specify whether it refers to objects or persons. Since "them" in English can refer to objects, it is a possible translation for the sentence in question. Just think it through. Bonjour Andy ! Yes, that's exactly how this sentence works literally. In French, you need to mention the thing that the quantity refers to, otherwise something is missing (She found one what?). 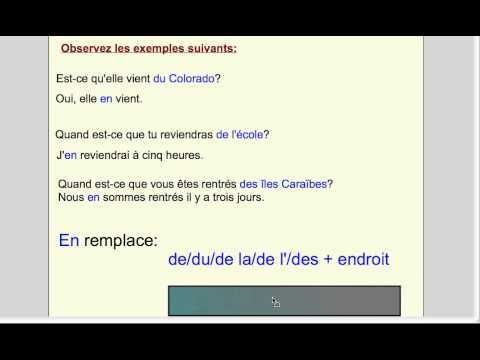 See the related lesson: En with quantities = Of them (adverbial pronoun) I hope that's helpful! Bonne Année ! Question from the Writing Challenge that references "en"
This lesson is referenced in the Week 1, B1 writing challenge but it does not contain information on the use of "en" in the part where the speaker says he will see places in Paris "that I've only seen in photos." The answer uses "que je n'ai vues qu'en photos." Why is en needed there? Thanks. Salut John ! In this case, "en" is just the preposition meaning "in", not the adverbial pronoun "en". We have "ne" + "que" = "only" and the "que" has contracted with "en" which is possibly what confused you? "en photo" means "in photographic form" / "in photos". Hope that helps!